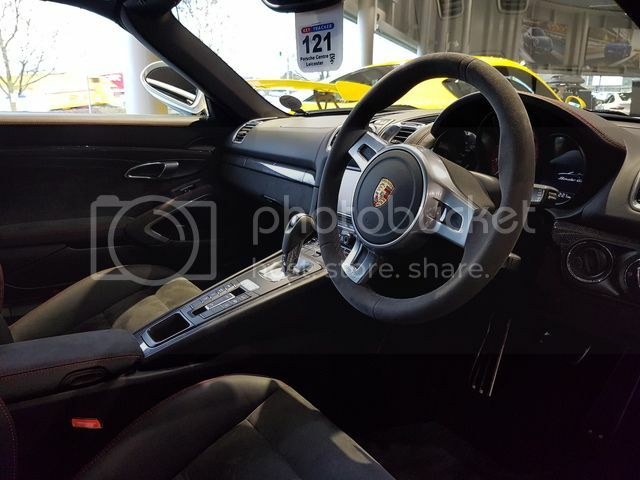 So a few events aligned over the past week that resulted in my purchase today of a 2014 Porsche Boxster GTS. However by the end of the summer I had resigned myself to the fact that I could not justify another car. I already had a convertible, albeit in storage and I have access to plenty of exotica when I need it. With SWMBO due a new car I decided the best compromise was to get her a sporty SUV that I would also enjoy driving. a Macan GTS was ordered for Feb build / Mar delivery. The problem was she hated it (I got a loaner for a day after order) and I was being stupid / selfish getting a car that was not suitable for her just for me to drive occassionally. So order cancelled, more suitable car ordered. 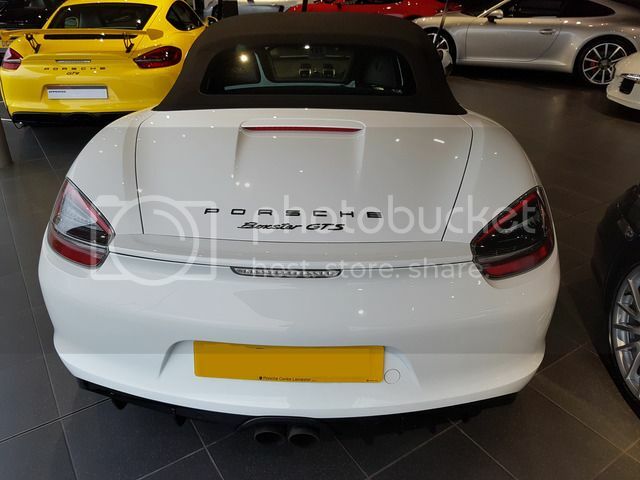 So by the alignment of the stars both obstacles to my purchasing a boxster where removed in the same week, one self inflicted ie get a sporty pram, the other fate ie selling my roadster. So I was back on the case. Needless to say I knew I would not get all but S, colour, PDK, sport chrono, PASM, sport exhaust where a must for me. Try getting one of those, I am convinced they don't exist. To be fair I just missed out on one very close but it had a dubious interior colour and in any event sold within a day as it had been underpriced for the spec probably due to the colour. More and more my attention was drawn to the one car which was guaranteed to have the base spec I wanted, the GTS. However I had set myself a price point last summer which excluded them and half the fun was in me finding the spec I wanted even if that took months. I had resisted looking for GTS's so excitedly browsed that evening and one car stood out straight away. Now I am not a religious person, I believe in fate. I believe that with patience the right car will come along and that feeling hit me straight away. Firstly the price was right (surprisingly so), the seller was right (OPC) and the options list, oh the options list, my holey grail car and some. It is a great feeling to know you have bought the "right car". No worries about compromise, etc..... just every box ticked. I'll not go into details about the deal that was struck but needless to say it was much better than I thought I would get especially given I perceived it to have a very good listed price. 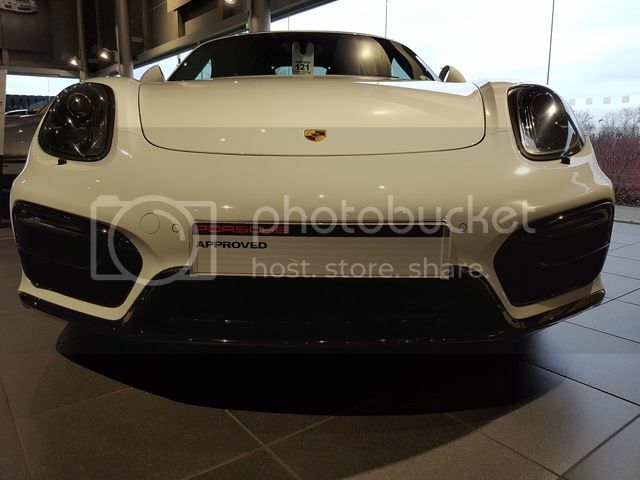 The deal does however include full porsche warranty until September 2019 (ie nearly 3 years ) and a full professional detail at a local well known detailer. The cars history is that it was specced (very well) by OPC Sheffield and sold as used within 1 week of delivery, back in October 2014. 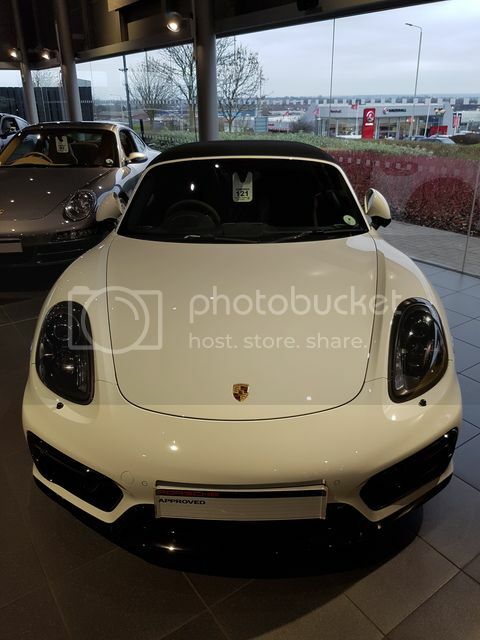 It was then traded in August 2016 and purchased by a well known client who purchased it as a stop gap for his mother pending a December delivery of a Macan GTS (how ironic!). On inspecting the car I noticed immediately it had paint protection film fitted (very well). That gave me a great start feeling with the car and it was obvious it had been well looked after. 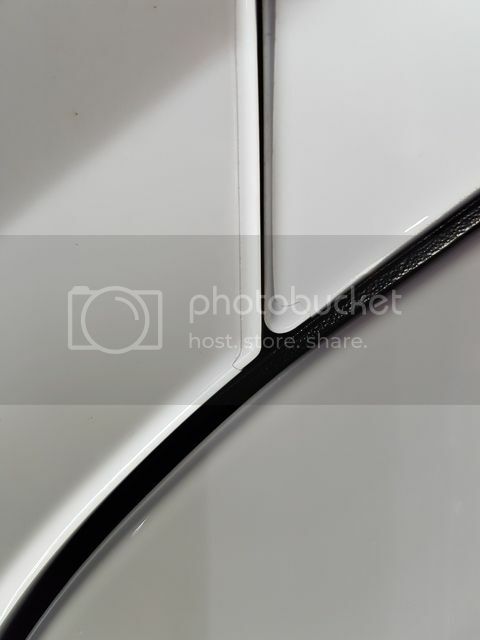 The first owner spent >£1,500 protecting the paintwork a sure sign of someone who cares about their cars. Was cycling behind one of these the other day (he was in a 30), very nice indeed! nice, that's a cracker of a motor! congrats on your purchase! OPC looks familiar and my experience with them was very good even when I had a niggle with the PSE and clutch oil that they sorted no questions. thrill it is to drive fast....that exhaust and engine rasp is absolutely intoxicatingly. Yes I got a good feel from the OPC and the SE I dealt with. We had a good honest discussion, cards on the table after about 15 min once I knew the car was right and a deal was done without any nonsense. I did get the usual sales pitch from the finance guy but he was a lancashire lad and sussed out within 1 minute I was not interested in finance, gap insurance etc..... I did go for the detail on the grounds it was done outside the OPC (turns out they use the same outfit I had in mind) and it cost me a lot less than they wanted. I would have quite enjoyed doing it myself but I'll be putting bit of mileage on it before I get it home so may as well get it done for the right price pre getting it dirty. PS for those interested it was OPC Leicester and they had some very nice stock including a very mint 964 which had just sold. Obviously I'm biased but the BGTS is a truly wonderful car. The sound of that engine is intoxicating and as you say it's not the same as an S. The cracks and pops you can generate on down changes are just epic. Apparently it has some additional tubes that allow more of the engine noise into the cockpit too. At some point in the future more folk will cotton onto to this car as one of Porsche's finest and they will be snapped up. 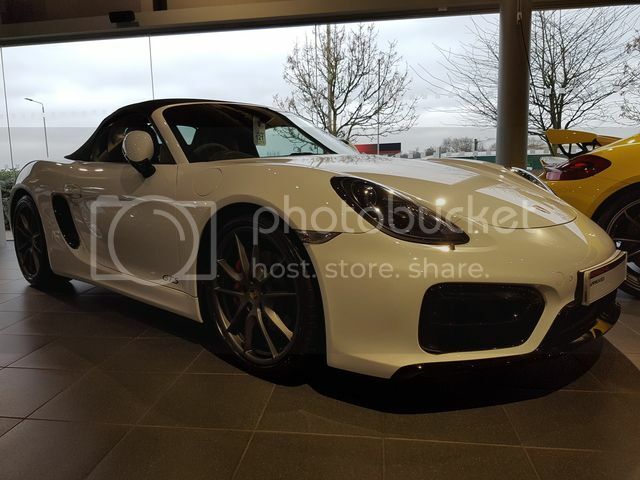 Jonttt buys a Boxster after my recommendation. Congratulations on the car Jon, it look absolutely stunning! That bumper on the front and the huge mouths look menacing. I'm not on facebook but I think they still have car meets at the chinese on the waterfront every so often put on facebook. I've meet Zingari there and hope to make some this year if they are still going. she squinted at a picture of it on the screen and simply stated "I suppose you'll be on the bloody computer all night now"
I'm jealous! I've been looking at these for a while. White or red it would have to be for me. That is a great spec. Oh the sound, what a great sound, that's why it's such a crime they have replaced with that horrible mess they call the 718 (Designation 982 BTW). Congrats, fantastic car. I might be joining you at some point. I can't decide whether I want another Boxster or go the opposite way and get a Macan. I'm in the US rigth now driving around in a Hyundai SUV and I'm liking the idea of having one of my own (SUV not a Hyundai).